Effortlessly elegant panning and pinching, rotating and zooming afforded by multi-touch enabled projected capacitive touch screens totally changed user expectations. Now P-Cap simply stands for Projected Capacitive provides a high-quality, multi-touch experience and suits many different applications. Multi touch interface gestures can provide an interactive user experience to replace the use of mouse and keyboard, i.e. Swiping imitates the finger motion involved in turning a page of a catalogue in a jewelry store or showroom. 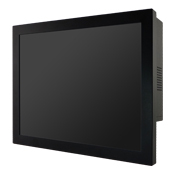 As a result, Winmate also use the tremendously popular Projected Capacitive touch technology instead of an older resistive touch in our Display and Panel PC products. With flat design for industrial use and P-Cap touch for tapping, panning, swiping and zooming that essentially taking the Display and Panel PC to the next level.